Known primarily for the campus of Northfield Mount Hermon School, this small town’s scenic landscapes, outdoor activities, and thriving arts community make it a perfect destination for couples and families. Northfield’s distinctive qualities only start with the fact that it lies on both sides of the Connecticut River, bordering New Hampshire and Vermont. Whether you like active pursuits or partaking of the local culture, Northfield is a quiet retreat from the big city all year round. The Centennial House Bed and Breakfast (94 Main St., 413-498-5921, www.thecentennialhouse.com, $117-$209) is located in the middle of Northfield’s historic Main Street. This elegant estate originally built in 1811 has six rooms with private baths, and room rates include a full country breakfast showcasing homemade pastries. Some rooms offer fireplaces and fantastic views of the Berkshire foothills. Across the river in Bernardston is the Fox Inn (71 Northfield Road, www.foxinnmass.com, 866-640-2796, $75-$85) with 28 rooms, and its own putting green. The Gill Tavern (326 Main Road, Gill, 413-863-9006, www.thegilltavern.com, $3-$20, open Wed-Sun at 5 p.m.) offers fresh, flavorful dishes made with local ingredients in an unpretentious setting 3 miles from Northfield on a quiet country road in the village of Gill. The Gorgonzola garlic bread and sausage stuffed Vermont quail are just two of the tavern’s signature creations. Traditional pub fare such as burgers made with local beef, and homemade thin crust pizzas are available for those with less adventurous tastes. The tavern also offers a full selection of local beers and wines. The Bella Notte (199 Huckle Hill Road, Bernardston, 413-648-9107, www.foxinnmass.com, $3-$29) offers an extensive Italian menu and scenic views in nearby Bernardston. Mim’s Market (60 Main St., 413-498-9900) is a full-service deli that also offers fresh baked muffins, bagels, and a variety of Green Mountain coffees. Northfield has a wealth of opportunities to enjoy its natural beauty. The place to start is Northfield Mountain (99 Millers Falls Road, Route 63, 413-659-3714, www.firstlightpower.com/northfield). Located along a seven-mile stretch of the Connecticut River, the mountain is open all year with 26 miles of trails for cross-country skiing, hiking, and mountain biking. The mountain’s riverboat, the Quinnetukut II, makes narrative cruises through the French King Gorge to Barton’s Cove, home to a nest of bald eagles. (Tickets for adults $12, children $6, daily at 11 a.m. and 1:15 and 3 p.m., June 26-Oct. 17.) Camping, canoeing, and kayaking are available at nearby Barton Cove Campground (413-863-9300, canoes and kayaks $25 for two hours, $40/day, $65/two days) on Route 2 in Gill. If you are kayaking along the Connecticut, make sure to paddle north toward the Schell Bridge. This historic bridge is closed but provides one of the most scenic backdrops along the river, and a fantastic photo opportunity. 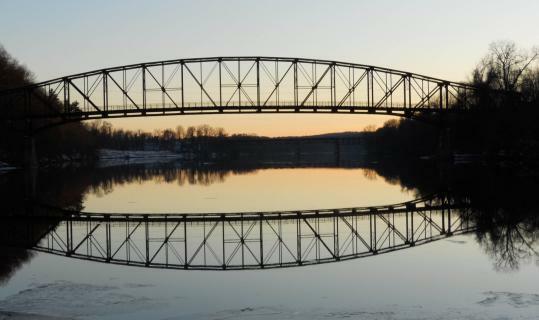 The bridge can also be viewed from the Pauchaug State Boat Ramp on Route 63 just before the New Hampshire border. At Northfield Mountain Antiques (1026 Millers Falls Road, 413-498-2414, www.northfieldmountainantiques.com, Thu-Sun 10 a.m.-5 p.m.), Ray Harris offers beautifully restored tables, bureaus, trunks, cupboards, and other items in addition to restoration services and classes. Green Trees Gallery(105 Main St., 413-498-0283, www.greentreesgallery.com, Fri-Sat 11 a.m.-5 p.m., Sun 1-5) displays work of local and regional artists, and hosts the Northfield ArtsFest (www.northfieldartsfest.com) and the “Scenes Along the Connecticut River’’ display in September. Green Trees Coffeeshop and Books (413-624-7119, www.coffeeandbooks.net) is open six days a week in the same building to enjoy a cup of joe and a good book. Northfield offers a number of farm stands along Route 63 that offer local products, and there is a farmers market every Thursday from 4-7 p.m. at the Trinitarian Church on Main Street, from May 28-Oct. 1. Northfield is a quiet town, with limited night life. There is the Northfield Drive-In (Route 63, Hinsdale, N.H., 603-239-4054, www.northfielddrivein.com, adults $9.50, children under age 12 $5.50, May 7-Labor Day), one of the few remaining drive-ins in New England. The Northfield Creamie (62 Main St., 323-459-5499, Tue-Sun noon-9) has been serving ice cream, milk shakes, and other summertime favorites for more than 50 years. In nearby Bernardston, the Bella Notte Restaurant has a DJ and dancing on Friday and Saturday nights from 9 p.m.-1 a.m. And the Gill Tavern has Trivia Nights on Wednesdays, wine tastings, and regional wine dinners. Matt Taylor, a Marlborough-based freelance writer, can be reached at MattTaylor0403@msn.com.